Home Apps Android Apps/Games Land Sliders – Slide the game world like scrolling the webpage. Land Sliders – Slide the game world like scrolling the webpage. Land Sliders developed by Prettygreat Pty. Ltd Slide the game world like scrolling the webpage and explore the land. Landsliders developed by Prettygreat is a casual roguelike with a ground-moving twist. with the goal of high-score chaser where collecting items across the various levels by avoiding danger is the task, The game mechanic we play which is really a clever way. You slide the game world around like you would scroll through a web page. All this reasonably interesting shifts a point of view, and there’s a crossy Road-style character collection progression system. All these intersting controls makes enjoyable game world and lots to explore. Land Sliders games involve randonly generated levels grabbing pick-ups, then escape through the exit and do the whole thing again. Thise doesn’t offer any time-based factor, You are rewarded for going around the levels and picking up as many of the items as you can possibly get, with a bonus for collecting all of the items in a level, before you move on to the next one. But of course players have to deal with the enemies and various hazards which are also present. This way we have to find trick to balance our getting rewards on the level with just surviving and advancing. Players are free to explore each level in full, finding every piece of swag and landmark that has been generated. Every piece of swag you pick up adds point to your score, but touching any of the deadly opponents or terrain roaming the various landscapes will end your run quickly. I will say that the game’s nature of sliding makes it difficult to do a lot of dodging. To increase power-upps collect coins which are used to unlock new and unique characters which offers different beautiful sound effects when chosen. And avoiding the danger is key to survive. You can spend 100 coins to unlock various characters. and these coins can be earned by completeing various tasks, or by watching video ads. These characters you choose has their own quirks and environment altering effects, will keep busy for you to collect. More coins will help to unlock characters these characters will give you star rating. The exploration takes in game on entirely by sliding like scrolling whole webpage. Players will swipe the screen to send their choosed character flying across the map and tap at any time to stop them. One of land Sliders geatured I love is phenomenal touch controls, which allows the gameplay to feel fast – paced while the play is going on their full control, These charactres can be stopped at dime just by tapping on screen. If you want character to go farther and fast give longer swipe and speed same way for short and slow swipe. This way tou will control character. You have already observed by now your character can’t jump but can traverse maps containing cliffs, they have free to ove ability to slide over gaps. Ther’s a short period after sliding over water or a pit during which they will float and can continue sliding. This not only opens up the world by allowing you to take shortcuts over lakes and between independant plateaus, also provides variety of strategies for transactions with the enemies that relentlessly pursue if you love it. 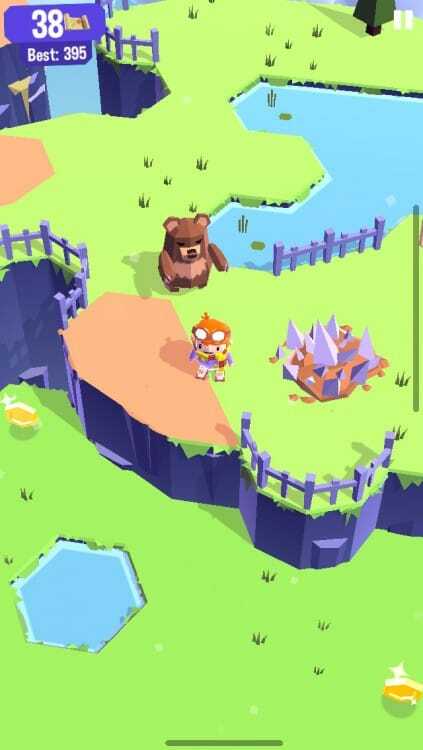 Sliding near bouquet of spikes is always a danger, But you will face dangerous hazards in Land sliders are roaming animals that want to catch you all costs. Drowsy bears will chase you like Zombie, dinosaurs on pogo sticks will bounce after you, cloud-riding spiders will rain venomous pools upon you. All you can control these animals by dodging which is always fun and keeps you by chasing you. Also you come across variety of animals in gameplay to deal with , hot sauce bottles, leading them into each other, or smartly fool them into falling into water. Or if you kill by plan you eaen even more swag to your score point. These swag is a stationary pieces of your character’s favorite item, simply scattered randomly on each stage. It compulsary that every stage to have swag collecting these will reward you Bonus. Land sliders game provides you always to slide in game this part of game will keep you hooked for long time. Some games demands differentiation with a story but land Sliders are simple and works great due to their playing style by same sliding mechanic, and same way which is subtle. you trigger quests and go to next level is the same way u decide to start a new game and select characters in the menu world. By sliding over the game and chased by wild animals. Land Sliders are well setupped landscape and portrait orientation, this feature ‘ve come to enjoy from games in the Crossy Road. I already enoyed a game as I want it to play, which is a great game for one-handed play on a phone, the game has great created worlds. Which is whimsical and makes you feel positive despite all the enemies trying to kill you. Characters in game are designed that they collect things they love with melodies music. Which is a great plus point to the game. The core experience of land Sliders are Entertaining characters, flawless controls and challenging levels, variety of strategies and lots of secrets and mysteries to uncover that transform Land Sliders from a high score chase into a true adventure.